How much lasagna does he eat? How much does it cost? The answers to these questions and many more. While Davis has since gone on to say that he wishes he’d made pizza Garfield’s favorite food, as lasagna proved difficult to draw, the gluttonous feline will always be remembered for his love of the baked and layered pasta dish (amongst many other foods). This Garfield detail, though, raises some questions and for the sake of cats, lasagna aficionados and the people of Muncie, IN, we need answers. In honor of today being Garfield Day, which is celebrated annually on June 19th, the same day that Garfield first ran in 1978, here are nine pressing questions that we have about Garfield’s lasagna habit answered. Is the lasagna homemade or store bought? Let’s look at the facts here. Jon, Garfield’s owner and caretaker, is a single adult male, who seems to have miraculously come into existence in 1978. He owns a cat and a dog, lives in Muncie, IN and feeds his cat lasagna, amongst other things. While these observations might not be enough to deduce if the labor intensive dish that Garfield yearns for is homemade or not, we need only look at Jon’s other cooking experience to see that he’s probably not making lasagna from scratch. In the Thanksgiving episode of the Garfield & Friends TV show, Jon prepares a meal for a date he’s having over and does so by putting a frozen turkey in an oven at 500 degrees and placing a variety of vegetables into a pot whole. Simply put, Jon does not know how to cook and while there’s always the chance that this beloved lasagna recipe could be passed down within Jon’s family, it seems highly unlikely. What does Garfield like in his lasagna? When it comes to what Garfield likes in his lasagna, he’s a cat with simple tastes. According to a particular strip in which Garfield suddenly has access to all of the necessary ingredients to make lasagna, the lasagna he loves includes only six ingredients: Pasta, tomatoes, onions, sausage, mozzarella and ricotta. Oddly enough, while Jon is depicted in the cartoon show as being an inept cook, the mere fact that he has the necessary ingredients on hand to make lasagna leads us to believe that maybe Jon is in fact cooking the lasagna himself. Or he can afford a private chef. Moral of the story, the Garfield extended universe may possess some inconsistencies. Is lasagna safe for cats? There are a number of foods that cats should not eat, including dairy in excess and onions. Obviously, these are both important ingredients in Garfield’s favorite lasagna recipe. As such, this means that Garfield is either actually a ghost cat that has already died, probably from too much cheese, a being of extraordinary supernatural abilities or a figment of Jon’s imagination. We lean towards options two and three. Why is the lasagna always family sized? It’s an inarguable fact that Jon loves Garfield. 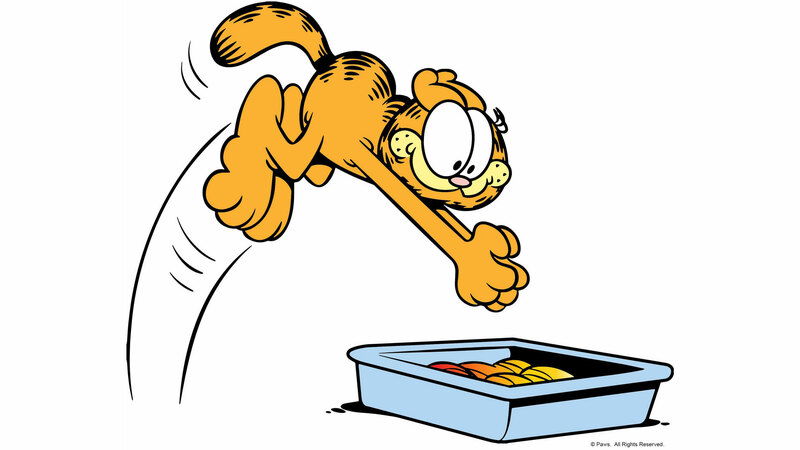 Regardless of the hijinks Garfield gets up to or the messes he makes, Jon always forgives him and there is always another tray of lasagna waiting for the dastardly feline just over the horizon. As such, Jon pampers Garfield with vast quantities of his favorite food, but rather than buying an individual sized portion, Jon always opts for the largest size. 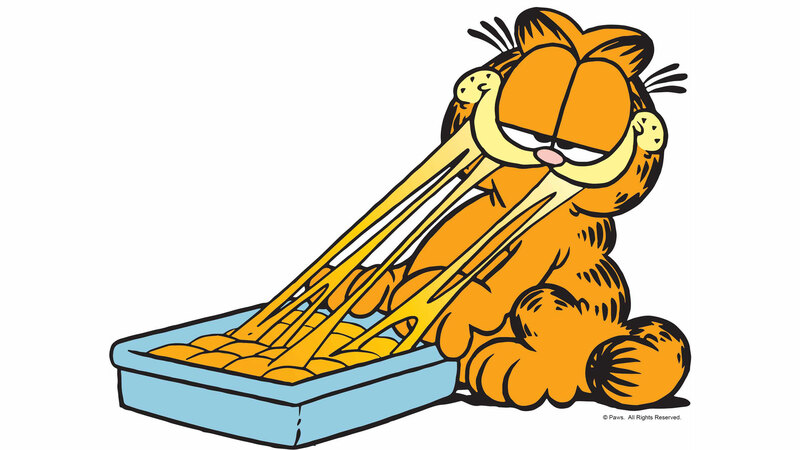 In theory, maybe Jon does this in hopes of sharing some of the lasagna with Garfield, but Jon never actually gets to eat any of the lasagna. Ever. Instead, Garfield simply barrels through it until he’s on the verge of passing out. How many calories is Garfield consuming? When Garfield eats lasagna, he doesn’t eat a slice and save the rest for later or share with his friends, he simply eats everything found in the pan. As such, we can determine how many calories he’s consuming using a family-sized frozen lasagna as a reference point. Frozen lasagna averages 270 calories per serving and includes five servings. This means that Garfield is consuming a minimum of 1350 calories each time he eats lasagna. Now, Garfield is a large cat, we’d guess around 20 lbs., thus he needs to eat anywhere from 550 to 600 calories a day. This means that Garfield eats between two and three times as many calories as required when he experiences his weekly lasagna binge. Alright perhaps if he were an Olympic swimmer. Not so much for a mostly immobile cat. At what speed is Garfield consuming lasagna? Due to the way comic strips are designed, it’s difficult to tell how much time has elapsed between cells. However, based on scenes from Garfield and Friends, we can roughly tell how quickly Garfield eats lasagna. Now, most of the time when Garfield gets his hands on his favorite food, he’s doing so in a sneaky fashion in hopes of not being seen by Jon. Due to his proclivity to be unseen, he very quickly eats said-lasagna rather than savoring each delicious bite. Based on footage from this amazing lasagna-themed music video, we can see Garfield devour an entire tray in 1.25 seconds. Even more incredible though is that he achieves this time on back-to-back trays, which are coming directly from Jon himself. The plot thickens. Why don’t the other animals get any lasagna? The simple answer here is that Garfield is a selfish (imaginary/super/ghost) cat and would prefer that no one got any lasagna, including himself, rather than share. 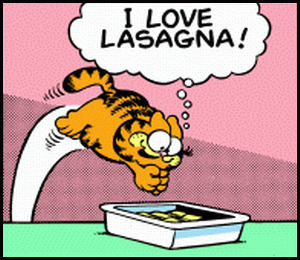 Very rarely, in fact, is Garfield ever really served lasagna, usually he just happens to come across it or smells it from the living room and then simply devours it before Jon knows what’s happened. More evidence for the super cat theory. How much is this costing Jon Arbuckle? For exploration’s sake, let’s look at this from both the prepared, frozen lasagna route and the scenario where Jon prepares it from scratch. If Jon makes lasagna once a week, that’s $7.29 for a single frozen, family-sized lasagna or $14.52 for the six necessary ingredients–assuming Jon is not buying in bulk–according to the specified list. Over the course of a year, that’s $379.08 for frozen lasagna or $755.04 for fresh ingredients. Then take into account that Garfield has been running since 1978 and, well, that’s a lot of money on lasagna. Why does Jon keep making or buying lasagna? After years and years of Garfield consistently stealing and eating all of his lasagna, Jon continues to provide it at home. Now, this could be because Jon’s been stuck in a West World-esque looping universe in which he has no choice but to constantly replace the lasagna or it could just be Jon just really loves his (imaginary/super/ghost) cat and wants to make him happy. Either way, seems like a bad investment.